Turns out I’m not the first to have this idea. Pioneer Woman for one, aka Ree Drummond, pushed this idea out to her millions of followers eight years ago. Yeah me. But I had some thoughts on how to make them better based on years of making really good soup. First … red onions. They have a deeper flavor, are a bit sweeter and caramelize darker than regular yellow or white onions. Second, balsamic vinegar. Just a splash keeps those onions a nice dark color and the sweet/tart flavor perfectly complements that deep caramelization. Red onions sometimes have a weird effect, turning a faint blue shade if the mixture is too alkaline and the acid brings that right back into the right color spectrum. Third, and most important, take the time to caramelize the onions properly. We want caramelized, not sautéed onions. 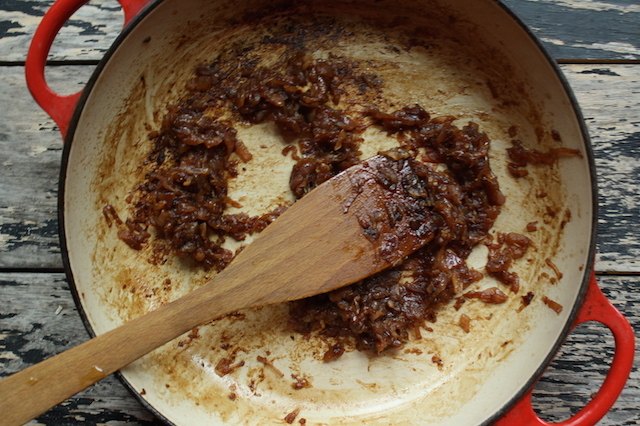 I want to be clear on this: caramelizing onions takes a long time and don’t believe anyone who tells you differently. I would say 45 minutes, minimum. I’ve got a few tricks to speed it up but if you read a recipe that says you can get caramelized onions in 10 minutes, turn the page. That is a lie. Finally, the cheese. Melted cheese is a key player in the french onion soup melange. I would argue the best part. I prefer gruyere as the nutty flavor really is the best but to be honest emmental or regular swiss work just as well. It’s a small amount, gruyere is expensive and the melt is most important anyway. 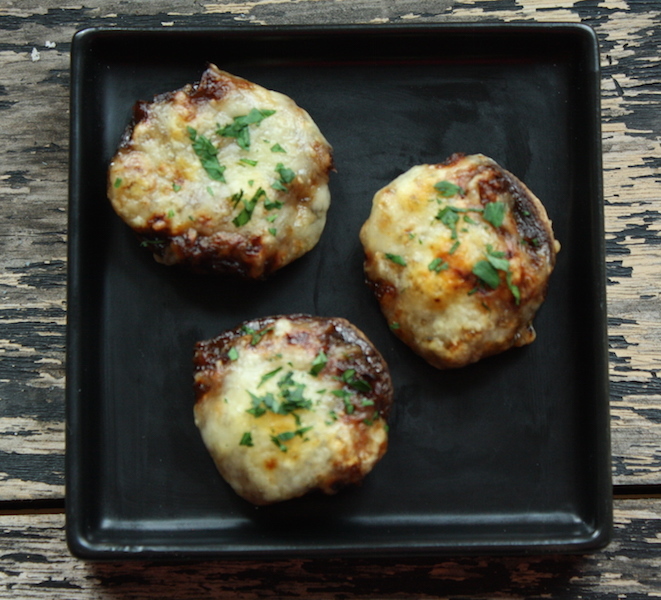 There’s one final thing we should discuss about stuffed mushrooms. They are one bite kind of things. Short of using a plate, knife and fork (who does that? ), biting a stuffed mushroom in half is awkward, messy and will invariably dribble all over your festive holiday outfit. Pop it in whole, especially this one as the melted cheese has a way of making a bite challenging. STRESS THERAPY BAKING FACTOR: EASY BREEZY. You need a nice stable of tasty, easy appetizers right now. These are fairly simple, look rather elegant and taste delicious. Onions, mushrooms, melted cheese? What isn’t there to like? Everyone will love them. As a bonus, there’s something pretty awesome about successfully caramelizing onions. It’s not difficult but as I mentioned, it takes time and patience. Do it right and you are a hero. This uses annoying small amounts of a few things – wine, stock. You can use water instead but taste and adjust the seasonings accordingly or if you have some bouillon paste in your cupboard, mix a small bit with water for the stock. Also, you may want to line your pan with foil, rather than parchment as I’ve shown, if you plan to broil. Parchment paper becomes alarmingly dark under a broiler and may catch fire. Stick with the foil. 1 Tablespoon minced Italian parsley for garnish. For the onions: In a heavy pot over medium, heat the olive oil and butter. Add the onions, salt and pepper and sauté over medium, covered, until the onions are deep amber and exceedingly soft, stirring occasionally, 25-30 minutes. Lift the lid about every 5 minutes to stir and check the color. They will soften and then slowly turn a golden brown. Once evenly but lightly browned, remove the lid and cook and additional 15-20 minutes until deeply colored. Add the stock, wine and balsamic; cook for another 5 minutes scraping the browned bits from the bottom of the pan, until liquid is cooked down and the mixture is fairly dry. Set aside. Preheat oven to 375°F with a rack in the middle of the oven. 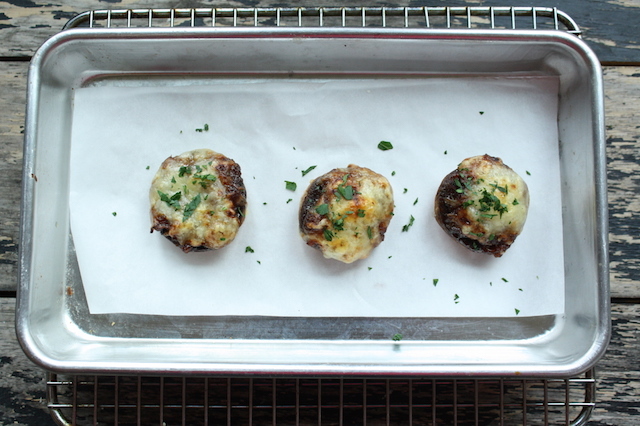 For the mushrooms: line a sheet pan with foil and give it a quick spritz of cooking spray. Remove the stems from the mushrooms (discard or save for another use) and place rounded side up on the prepared sheet pan and give the mushrooms a quick spray with cooking spray. Flip the mushrooms, pouring out any accumulated liquid, and fill the cavities with the caramelized onions. Top with generous pile of cheese and place in the oven until the cheese melts, 10 minutes, then if you wish, fire up the broiler and broil the mushrooms for 1-2 minutes until nicely golden brown. Let cool for a minute, garnish with the chopped parsley. Serve warm. Do ahead: you can caramelize the onions up to 2 days ahead. The mushrooms can be initially roasted a few hours ahead of time and keep tightly covered so they don’t dry out. 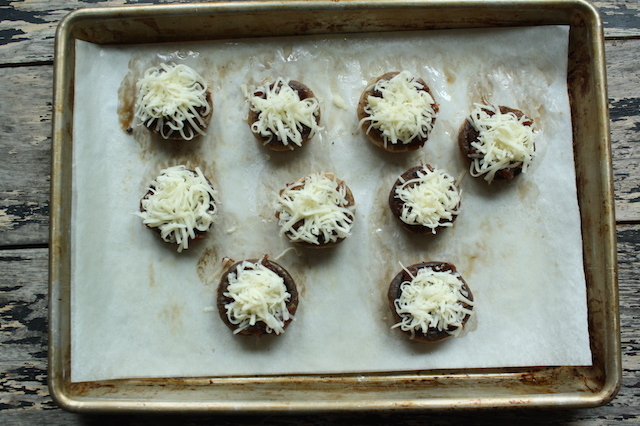 The stuffed mushrooms can be assembled a few hours ahead, kept covered and finished baking/broiled just before serving. Yum!! Your like your momma, I also love any kind of stuffed mushrooms. This one is a keeper. Your right about the size of the mushrooms. Too big and you need and knife and fork, too small and there’s no cavity to stuff. Just right and your stuffing them in like popcorn!